This week has been a busy one. We have had international help, wind tunnel testing, working with other university projects, a visit from the Vice Chancellor and a whole load of CFD on top of all of this! Starting with the help from across the pond, we have been lucky to have project support from FlySight who are helping us develop a telemetry and navigation system with head up display so that we can track our progress when we get to test jumping. FlySights are unique in providing real time feedback so the pilot can learn how to improve performance. We have been busy on CFD as always and over the past few weeks we have been working on our actual wingsuit planform shape. 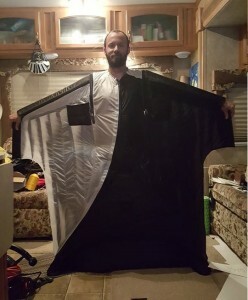 Planform is the area seen as if looking down on the suit from above and is the largest factor in how a wingsuit flies. We have been looking at various aerofoil shapes in order to try and push the maximum performance out of our suit. Finding a suitable aerofoil has not been without issues. It needs to be thick enough to allow for a human form to fit inside, it has to be manufacturable and provide enough performance to allow us to break world records! We have also been having trouble with tapering the suit to a tip, but that has proved more difficult in our CAD program than it will be in real life.